A beautifully maintained 1982 Corvette reading 31,988 miles on the odometer. Originally owned and purchased by Phillip Epps, a former Packer's pro football player at Walker Chevrolet in Texas. The last year for the C3 corvette was perfected with a sleeker front end and cutting edge technology for the time. The cross fire fuel injection system utilizes two throttle bodies that work together through a computer control module. Together, they provide a very unique, reactive throttle response. The overdrive 700R4 transmission is a huge driveability increase allowing for a 30% reduction in highway cruising RPMs and also allowing for a greater top speed. The bucket seats are very comfortable and give you a nice view through the windshield and at the center mounted gauges. With a great history, included original documents and being all original this Corvette is ready to meet its next owner! 1982 saw the debut of the “Cross-Fire Injection” fuel delivery system. This TBI (Throttle Body Fuel Injection) was not the type of fuel injection installed previously in some C1 and C2 Corvettes. It utilized two throttle bodies combined with Chevrolet’s computer control system. The engine produced 200 hp and was mated to a new four-speed automatic transmission with torque converters bypass in the top three gears. Compared to the previous Turbo-Hydramatic 3-speed, the new 700-R4 transmission had a lower first and second gear for improved low-end acceleration, and a fourth gear overdrive that would reduce engine RPM by 30 percent at highway cruising speeds, resulting in better fuel economy. The final model C3 Corvette's published performance numbers were 0-60 in 7.9 seconds-the quarter-mile in 16.1 @ 85 mph. This was the last year for 8-track tape availability and new “cross-fire injection” emblems appeared on front fenders. Nose and fuel door crossed-flags emblems changed to a more squared design. 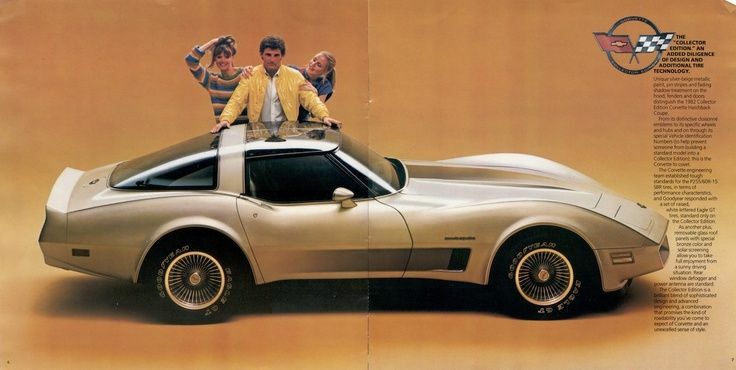 In 1982 Chevrolet knew this would be the last year of an entire generation of Corvettes and so commemorated the occasion by offering a Collector Edition with separate serial number sequencing, silver-beige paint, unique wheels patterned after the 1967 model's bolt-on alloys, and an operable rear hatch window.